It’s hard to replicate the magic of the right in-studio class, however it’s not always possible to make it to the studio for an hour-long class. I feel you, I get it. Enter, the elusive home practice. At home sessions give you the opportunity to explore your personal practice at your own pace, in your own time. If you stay open to it, it can be an empowering experience. Here are some tips to make the most of your time on your mat. Make a date with yourself - and don’t cancel! Find a time that works with your schedule and stick to it. If you don’t have an hour, or even 15 minutes to carve out, work to meditate for 5 minutes in the morning, or do some stretches before you get out of bed. It doesn’t have to be grand - but showing up can start your day in a big way! Find the atmosphere that works for you and your lifestyle. The ideal is to find a quiet, tidy space where you can find focus. It helps to de-clutter the mind when your space is de-cluttered. Set up a Spotify playlist or move in silence. Your space, your rules. Maybe you have 4 kids running around, the TV blaring and your mother-in-law visiting. That’s okay too. Accept that your practice will be different than in-studio. Maybe today it looks like pausing before reacting, maybe it’s taking 5 minutes to focus on your breath in the morning before you get out of bed. Maybe it is throwing down your mat amidst the chaos and finding 10 minutes of movement. Heck, invite them to join you! Own your practice, however it happens. Once your space is set up, take a few moments to connect with your breath and check in with the physical body. As you begin to quiet your mind, turn your attention inward to the emotional body and pay attention to your inner voice. Choose to set an intention for yourself if it feels right. This is a skill that pays dividends off of your mat. Take a few moments to warm up the body. Think about the movements your instructors guide you through at the beginning of class. Start with gentle postures and gradually increase the movements. In your home practice you can focus on your specific movement and mindfulness goals. Not sure where to start? Start with your favourite poses. Go through the poses you know, try different transitions. You’ll likely find you know more than you think! Get creative and enjoy the process. As always, listen to your body and stick with what feels good. There are plenty of online classes you can access at home. Our In Fine Feather instructors are always happy to chat, and you can also draw inspiration from our Flow Progressions on In Fine Feather’s Instagram & IGTV. Last, but not least - don’t get discouraged. Practise does not make perfect, because there is no perfect. Use your home practice to get curious, find some moments of connection, and move your body. If in the end you find in-studio sessions are what works best for you, we’ll see you on your mat in class. Michelle found yoga after a lifetime of organized sports gave way to post-secondary student life. Struggling to keep a steady gym routine, she enrolled in a yoga class. She quickly found herself continuing to return to her mat after noticing a sense of focus, steadiness and ease in her chaotic schedule. The four corners have remained the space where she can slow down and reconnect with herself. Looking to strengthen her personal practice, Michelle enrolled in 200-hour teacher training at Anjeli Teacher Training Academy with Diana Lockett and Daniel Horgan in 2017. She quickly felt the call to share her passion for the healing properties of yoga and thoughtful movement with others. 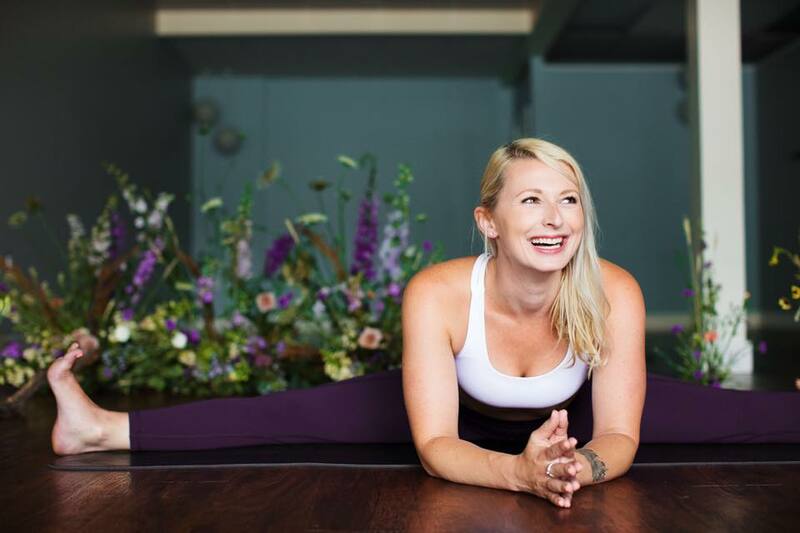 Michelle’s teaching and practice take a light-hearted approach to an alignment based and heart centered class that encourages exploration of the body and spirit. It is her goal to guide herself and her students to be present and connected with one’s self, surroundings and Universe. Find Michelle on Saturday afternoons at 12:00-1:00pm for an Intermediate Flow class. Register here!